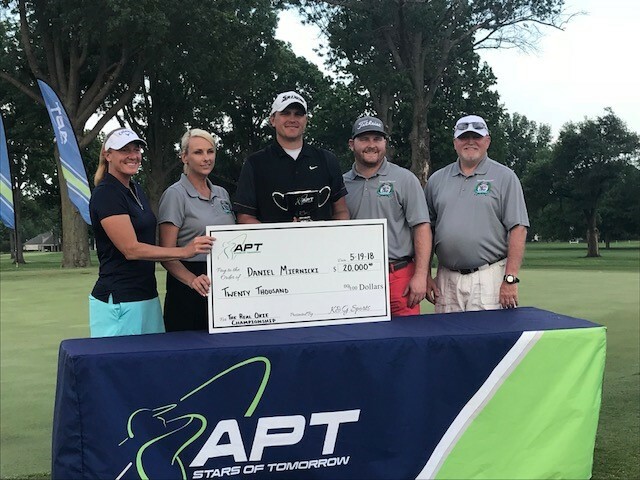 APT Golf Tournament – REAL Okie Championship. The grant provided support for the first APT Tournament in Muskogee. The APT tournament is host to up and coming professional golfers who hope to play in the PGA, and conducts professional golf tournaments in six states. Each tournament emulates a PGA tour week; practice rounds, parties, youth clinic, a pro-am and a 72 hold pro golf tournament. APT players come from all over the world to play. The APT golf tournament brought 134 professional golfers to Muskogee, along with many of their families and fans. Golfers came from 15 different US states and nine different countries including: Scotland, France, Trinidad, Australia, British Columbia, Spain, South Africa, Norway, and the United States. During one of the activities where fans and citizens were able to mingle with players, a local Muskogee citizen came to realize the young man he was talking to was from the same small town in Australia as his late wife. The two struck a bond and have continued to communicate. The man plans to host the player in his home next year during the 2019 tournament.